The CADORIN product can be found throughout Italy and is also available from various overseas retailers, our AUTHORIZED DEALER PARTNERS. To find your nearest dealer please send us an email, call us or fill in the form in the contact section of this website and we’ll be in touch as soon as possible. Thanks! 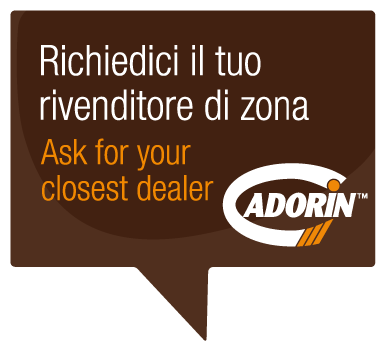 The Cadorin Group Srl headquarter is in Possagno (Treviso - Italy), at the foot of the Monte Grappa massif, not far from Asolo and Bassano del Grappa, close to the Dolomites and about 75 km from Venice. Possagno is the birthplace of the famous painter and sculptor Antonio Canova (1757-1822), who is now buried in the majestic Temple that he designed himself. In Possagno you will find the "Gipsoteca" (or plaster-cast gallery) and Canova’s House, nowadays a museum. In the "Gipsoteca" you can admire the original plaster casts of sculptures by Antonio Canova. In the wing of the Gipsoteca designed in 1956 by the architect Carlo Scarpa, stands one of the most famous sculptures: "The Three Graces ". In the Canova Museum you can see many Canova works including paintings, drawings and engravings, work tools and clothes worn by the artist, as well as some beautiful marble works. in about 30 minutes Bassano del Grappa (towards Vicenza) and the Dolomites Park (towards Belluno).